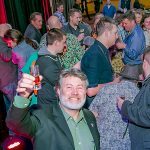 There is a lot about the Lost Spirits Distillery that is unique to the distilling community. Few subjects are more likely to bring out pitchforks and torches from traditionalists than their accelerated-aging technique — creating flavor precursors by tweaking fermentation and bombarding the resultant spirit with photons to push chemical reactions forward, creating flavors in a few days that usually take years in barrel to achieve. 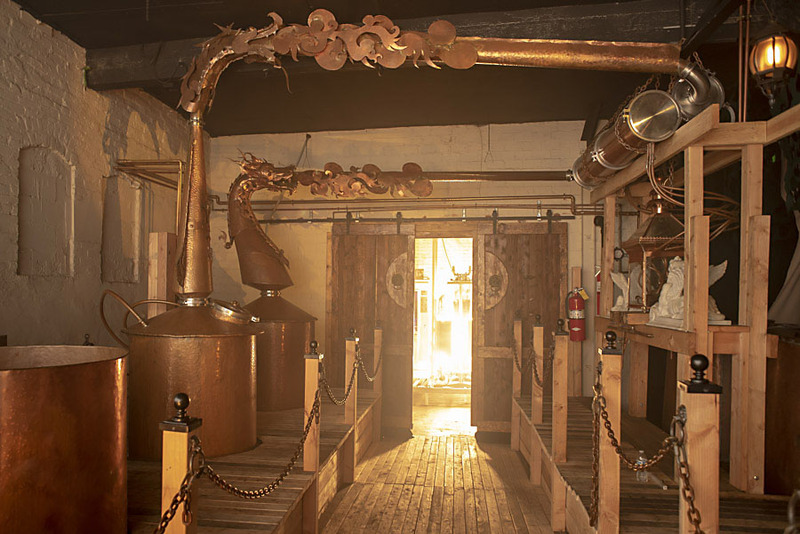 Beyond the controversy, visiting the Los Angeles distillery creates a visitor experience unlike any other, so much so that ADI awarded Lost Spirits with the Best Distillery Visitor Experience 2018, and in a city that makes entertainment its business, the distillery itself was nominated for a Thea Award from the Themed Entertainment Association. But awards alone, though well-deserved, do not do justice to the experience of visiting Lost Spirits. They simply cannot explain why this is different from any other distillery you have ever visited. If you wish to be surprised on a distillery tour that is full of surprises, then let this serve as a spoiler alert: Stop reading. Don’t look at the photos in this spread. Go straight to the next article, and book a flight to Los Angeles. 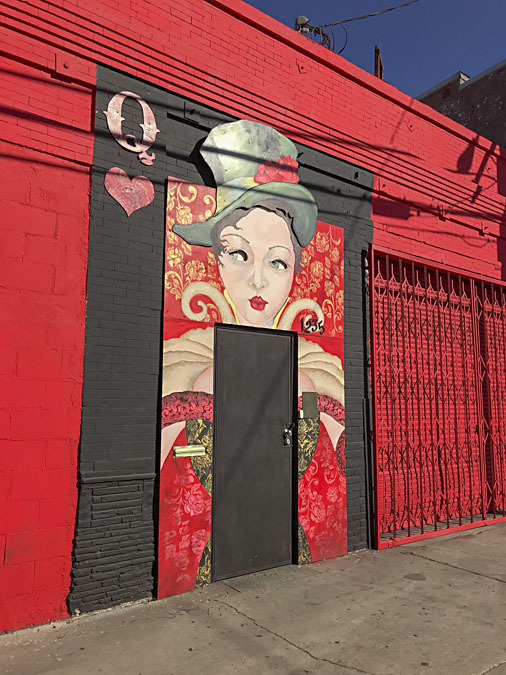 The Queen of Hearts greets visitors from an otherwise drab brick façade with steel-barred windows, across from a produce distribution warehouse in downtown Los Angeles, on the border between the Arts District and old Skid Row. 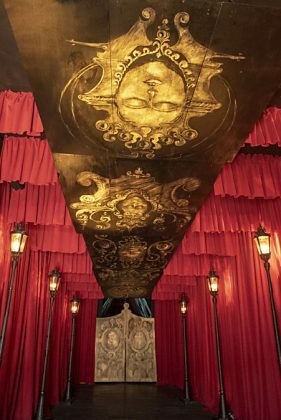 The red queen straddles the entrance in a style evoking the Roaring ’20s and tarot cards. If it seems like the queen’s eyes are shifting, that is because they are. A simple mechanical device periodically turns her gaze from one side to the other. Once inside, the entrance is not only dimly lit but painted dark, a contrast from the relentless L.A. sun. Stark beams of light focus on things that Lost Spirits wishes for you to see. Once organized, the tour leads up a ramp toward a door that appears large and infinitely far away. A perspective trick makes the short trip up the hallway seem distant. Visitors follow the ramp to find the door closer and smaller with each step. 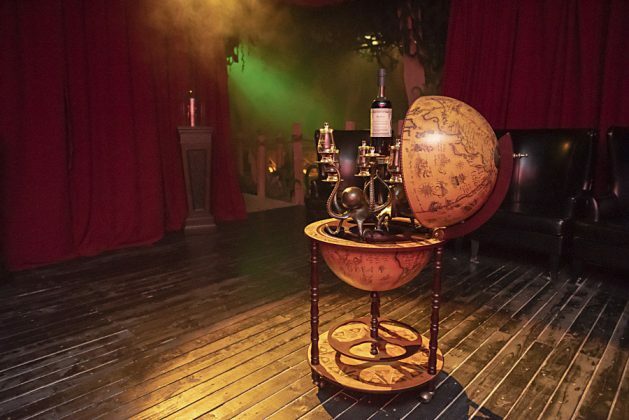 Inside, 12 chairs form a circle around a globe suitable for the adventures of great explorers like Ernest Shackleton, Sir Edmund Hillary or perhaps Sir Francis Drake, a hinged globe that opens to reveal 12 Glencairn glasses and a bottle of rum. At this point, visitors hear a tale of misguided Victorian explorers who have to resort to… well, I won’t tell you what they did to the rum. Let it be a surprise. Drink up. With a crack of thunder, a curtain opens on the other side of the room and a wooden ramp is revealed, leading down to a boat — yes, a boat inside a distillery — gliding to the other side. The lights go off as the barge glides through pitch black. Jungle noises come up and eyes glow in the darkness. 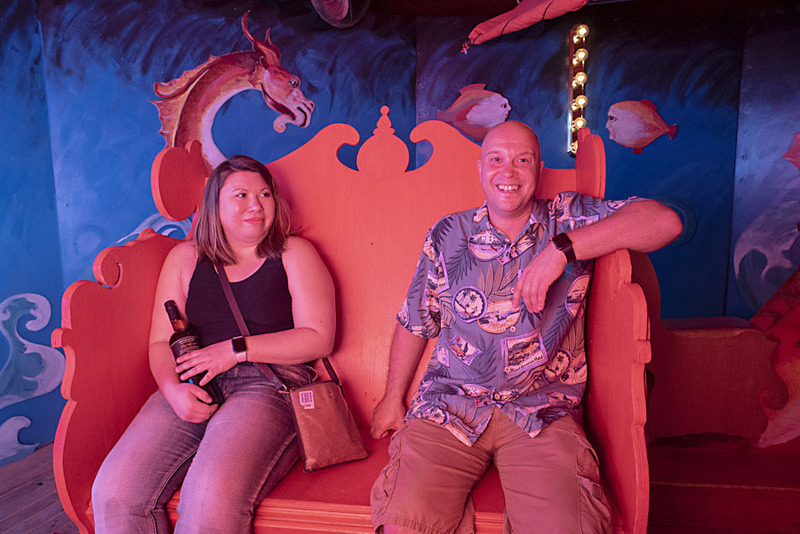 If it all seems a little like a carnival ride, that may be because distillery co-founder Bryan Davis has made good use of his art degree from the San Francisco Art Institute at his first job: designing carnival rides. It’s not his first carnival and neither is it his first distillery. 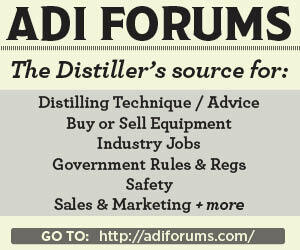 Along with partner, Joanne Haruta, Davis ran an absinthe distillery in the Catalan region of Spain from 2006–2009. When the couple sold that, they set up shop in Castroville, CA… well, technically it was Salinas, but the distillery was on a farm on the outskirts of Castroville. There he experimented in altering fermentation to create flavor precursors that might be found in the dunder pits of traditional rum distilleries. Davis developed a reactor where a spirit, infused with oak, would be bombarded with high intensity light for six days to push forward reactions and mimic what happens in the hot, humid barrel warehouses of the Caribbean. After moving to Charleston, SC, for a brief stint, Davis and Haruta pulled up stakes, moved to L.A. and opened shop again in February 2017. 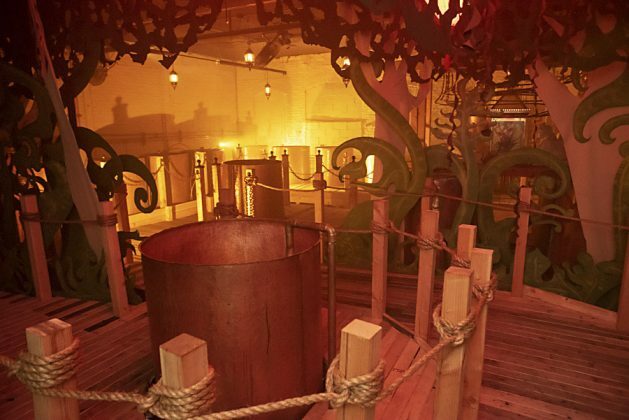 Lost Spirits first opened the tour for bartenders and retail clients in June 2017 to give clients an experience that would generate buzz. It became successful beyond expectations. Soon, buyers were asking for special tours because their family had come to town or for their “dear friends” who are “really well-connected in the industry.” Lost Spirits tours gradually transitioned to the public and now take reservations for a limited number of tours on Fridays through Sundays. Internet bookings fill up two to three weeks in advance. After the boat passes the eyes in the dark, the dim red lights come up and glow through dry-ice fog. The ferry lands at a wooden ramp. Rope rails strung from post to post follow a path around a fermentation vessel, then down past a dimly lit row of fermentation tanks, making a full U-turn to face two copper stills, which Davis made by hand and has sculpted into the shape of dragons. The flock passes underneath lyne arms, between the pots and condensers and toward the intense light glowing from behind a large door. There the reactor sits. Davis’s reactor, in which he claims to make the equivalent of 20-year-old spirits in six days, is what has brought the most acclaim, notoriety and controversy to the distillery. The reactor has taken rapid maturation several steps beyond small barrels. Davis first developed the technology at his Castroville distillery and later developed production models in Mountain View, CA. If other distilleries have business models designed around selling bottles, Davis built Lost Spirits around intellectual property. Lost Spirits licenses the technology to several DSPs to create their own spirits with the reactor. The reactor drives chemical reactions between the spirit and wood forward by bombarding the spirit with intense light. The light is so bright that it is unpleasant to be around the reactor, something which has visitors caught between the curiosity of absorbing as much as they can and picking up their pace to avoid the discomfort. The guests curiously take in as much as they can of the strange configuration of glass tanks, microprocessors and high voltage wires while pushing through the next door into a calm hallway lined with pictures — and their next dram. Who could refuse? The trek pops out the back door of the building to find it raining on an otherwise sunny day in a city built over what would otherwise be a desert. A boardwalk passes through a jungle, landscaped with banana trees, ferns and palms, creating a tunnel around the path and erasing the sights and sounds of the industrial neighborhood. Irrigation misters spray the upper branches, dripping down successive layers of living greenery leading along the back of the building to another entrance. 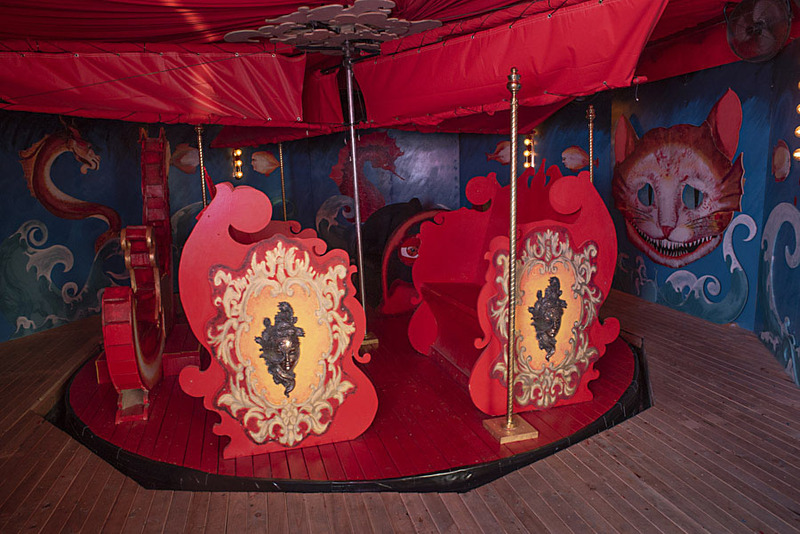 Back inside, a ramp leads up to a circular room, painted like a carnival ride. 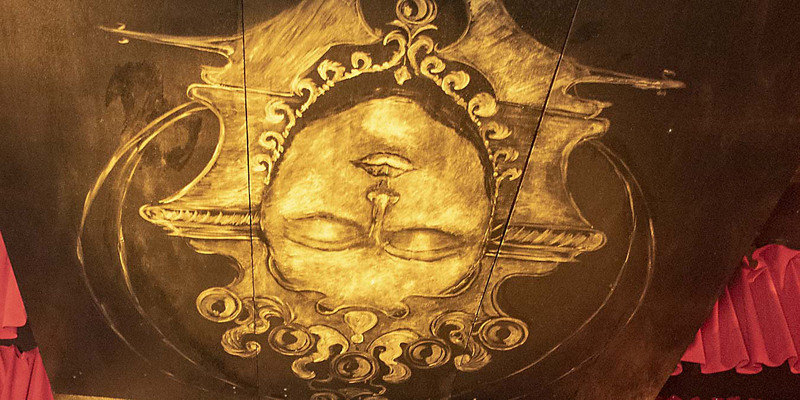 A circular raft sits inside a circular cutout for visitors to ascend and board. The room goes dark and the boat spins slowly in a whirlpool, in silence, in the dark. When the lights come up dimly, the entrance is gone, but a wall has opened on the other side. Jungle animals call from across a pond lush with vegetation. 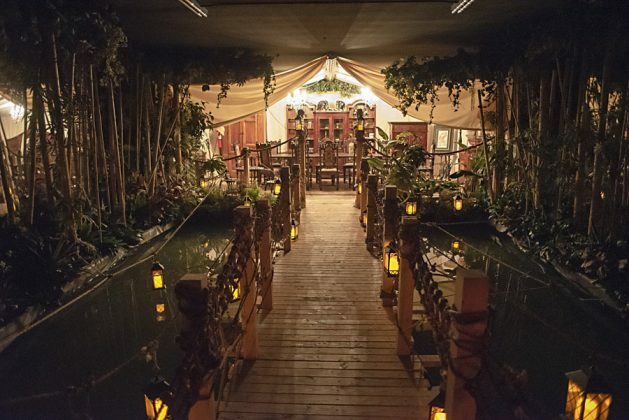 A wooden bridge leads to the whiskey room on the other side. Vines crawl up the canvas sides of the room. Amid furniture suitable for Commander McBragg himself, the visitors sit and listen to the stories of how the whiskey was created against all criticism. Lost Spirits serves the Abomination, which garnered 94 points and the designation of “liquid gold” in the 2018 edition of Jim Murray’s Whisky Bible, setting off a maelstrom of controversy. The story of Lost Spirits continues until the drumming starts. Visitors are advised that the drums mean the natives are on the warpath and they must escape and run for their lives… only how? 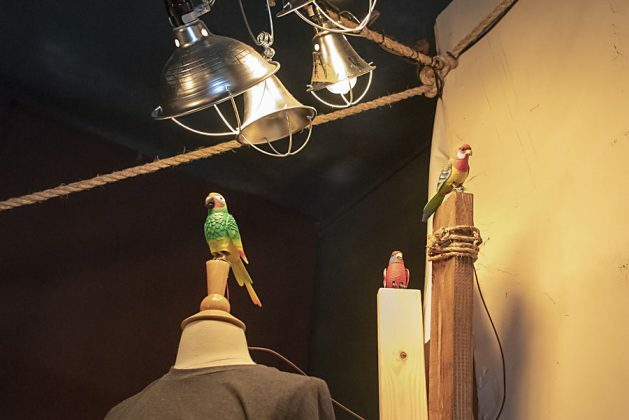 Of course, the hosts point to a convenient escape route: through an antique armoire, past hanging fur coats into the back of another antique armoire, pushing past hanging tuxedos to emerge into the gift shop, which looks something like an ancient Egyptian tomb. The room is resplendent with sphinxes, swag, T-shirts, bottles and animatronic birds, which sing and tell you to buy lots of whiskey. The tour has become so popular that Davis and Haruta have begun construction in a nearby building for a revised expanded distillery and visitor experience. A new production facility is also under construction in Vernon, south of downtown L.A., to prepare Lost Spirits brands for wider distribution.